(April 1st ) - * Arrival Day. Fly into Cabo San Lucas, spend the night at a local hotel. (Arrangements on your own). Airport; Cabo San Lucas International Airport. DAY 1 ( April 2nd ) - Pick up by van at 10:00 at hotel (pick up will be at a specified hotel). Van will shuttle to you to boat ramp to board the M/V SEA ESCAPE. Once we are all aboard we depart to San Benedicto Island. Departure time is around 11AM. 20 hour boat ride to the islands. Day 2. - Arrival to San Benedicto Island between 12-1 PM. Diving all day. Depending on Sea life and weather conditions, SEA ESCAPE would stay at anchor for a second day of diving, or move to Socorro Island during the night. Day 3. - Diving all day at San Benedicto or Socorro Island. Day 4. - Diving all day at Socorro Island. At dusk, SEA ESCAPE will depart towards Roca Partida, (weather depedant) (7 hours). Day 5. - Diving all day at Roca Partida. If weather conditions allow, SEA ESCAPE will remain at Roca Partida for a second day of diving. Day 6. - Diving all day at Roca Partida or back to Socorro Island. Day 7. - Diving all day and depart to Cabo San Lucas at 4PM. Day 8. - ( April 9th) - Arrival to Cabo San Lucas at 2PM, transfers to your hotels. Considered Mexico's Galapagos... Located in the eastern Pacific Ocean, approximately 240 miles south of Cabo San Lucas, Mexico, is the Revillagigedos Archipelago, more commonly called Socorro. The diving at Socorro Island, Mexico has been made famous for its big animal encounters. Friendly giant mantas and dolphins have been known to approach divers, giant schools of silkies, duskies and scalloped hammerhead sharks often cruise in the nearby distance. Silvertips patrol the cleaning stations with yellowfin tuna zipping overhead. Our expedition is specifically timed to arrive at the archipelago during the heart of the humpback whale migration when mothers are looking after their newborn calves. Whales are often spotted at all the islands we visit and if we are really lucky, we may have an opportunity to swim with them as well. Highlight Video from our 2016 expedition. One of the things Socorro is famous for is their manta rays. They have a large population of manta rays that migrate through the islands every year. These encounters are legendary. Friendly mantas will often approach divers asking for belly rubs. (although divers are not allowed to touch them.). The mantas also enjoy the feel of your regulator bubbles on their bellies and will sometimes hover inches above your head. 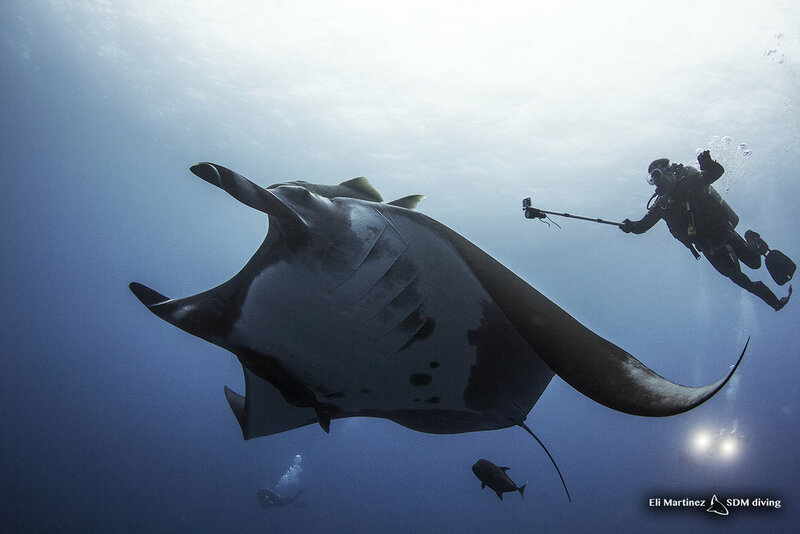 It is an incredible feeling when a wild and free manta ray swims up to you and wants to interact... It is just true ocean magic. Female humpbacks migrate through here each season with their newborn calves. 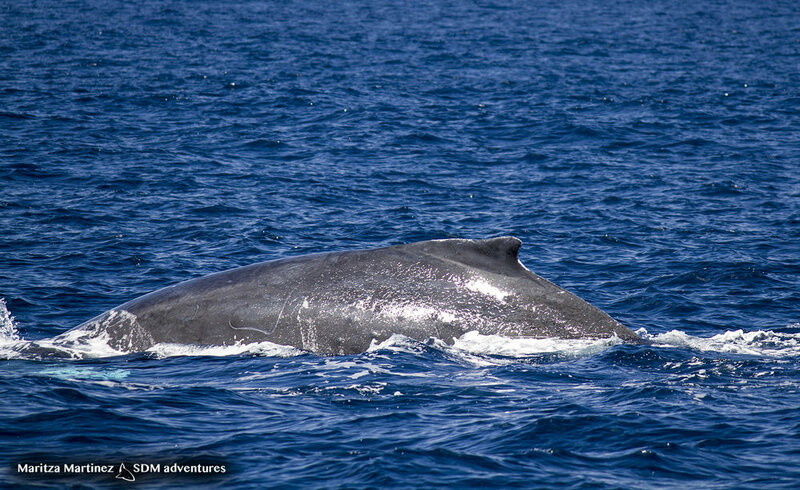 We plan our expeditions here during humpback whale season. Our hope is for opportunity to get in the water with them. Most of the time, the whales want nothing to do with us and will swim off as we approach. But every once in a while, divers here get lucky and mothers will tolerate their presence. During these encounters, the babies have been known to approach divers. Which is what we are hoping for. Mantas and whales are not the only reason to dive Socorro. although they are the stars of the show, there is also opportunities to play with friendly bottle nose dolphins or photograph schooling scalloped hammerheads, silvertips, silkies, Galapagos sharks and piles and piles of whitetip reef sharks. Some spots are so thick with tuna, jacks and other pelagic life, it is visually over whelming. Let us know you're interested in joining us. Thank you for your interest in our Socorro Diving Expedition. We will send you more information on this trip. If you have any immediate questions, regarding the expedition, please feel free to call us, or send us an email.